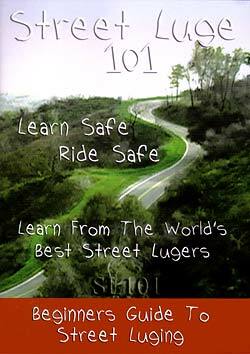 Special: Street Luge 101 on sale now! Check out the Trailer to see what this video is about. 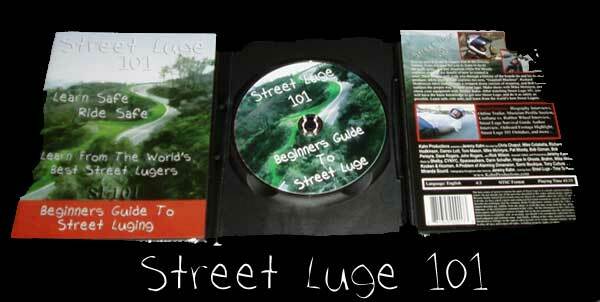 Street Luge 101 is an instructional how-to video made with the newbie in mind. How do I get into Street Luge? Where do I get my equipment? How do I find out more information about Street Luge? How do I make shoes? What happens if I crash? All of these questions and many more are answered in this video. The professionals within Street Luge 101 are the best in the world. You will be taught what you need to know by those who know the best. Everyone within this video has competed all over the world and has an extensive background and history on Street Luge. After watching this video, you will have the basic knowledge needed to become an active participant in this amazing Gravity Sport. Click on Info to see the contents of the video. DVD* - $22 (Shipping&Handling Included in Lower 48 United States). *Note: This is in the NTSC format. This might not work on all international (Outside of the U.S.) DVD players. Most PAL DVD players read both NTSC and PAL, however there might be complications. Please e-mail STRTLUGE101@aol.com if you need help with making sure it's compatible. If you'd like to pay with Check or Money Order - Please e-mail for details.